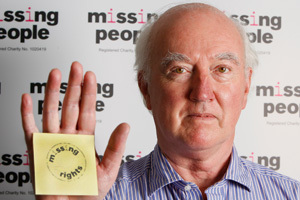 I want to give you my take on the “Missing Rights” campaign, which aims to improve emotional, practical and legal support for families of missing people. I went to the launch in December 2010 and progress since then has been amazing! In March 2011 The All Party Parliamentary Group for Missing and RunawayChildren and Adults (APPG) decided to hold an Inquiry into this issue and arranged Hearings in Parliament. The hearings outlined that Legislation is needed not only for Presumption of Death to replace the current convoluted and expensive mix of Common Law and Statutory provisions, but also for Guardianship Orders – these enable a family member to apply to a Court for an order, to give them authority to deal with a missing loved one’s practical affairs, including banking, mortgages, insurance, etc. I gave evidence at the hearings and after the March meeting I did several media broadcasts and the Ministry of Justice (MoJ) issued a statement in response, saying that existing laws were sufficient, that few people would be helped and that it would cost too much. They were going to do nothing at that point! You can imagine my response in the media!! We were privileged to present the APPG inquiry’s findings to No 10 Downing Street in July. The recommendations were strongly in favour of legislation to help families of missing people negotiate their way through the minefield of bureaucracy they face, in dealing with everyday practical and financial affairs, and ultimately coping with presumption of death. The MoJ did not have to take notice of the APPG inquiry but luckily the Justice Select Committee (JSC) decided to hold its own Inquiry (and MoJ do need to take notice of that). They held Hearings in November 2011 which I attended, giving me the opportunity to speak to the Minister, Jonathan Djanogly MP. The Minister promised the JSC that he would look carefully at their recommendations, and those of the APPG, and would respond by the end of the Parliamentary session. The JSC published a report strongly recommending to Government that legislation is necessary and nothing short of legislation will suffice, to relieve the suffering of the families of missing loved ones, currently experienced by thousands of families. This was also the position of Missing People, who gave evidence to the panel on behalf of the families the charity serves. I did numerous TV, radio and press interviews with Sir Alan Beith, Chairman of the JSC on the day the Report was issued, as did Missing People. We pushed the case for the MoJ to respond positively and since then, the APPG has met to discuss how to encourage the Government to take the report forward. When Nigel Adams MP (Selby and Ainsty) stood up in the House of Commons to ask the Prime Minister a question on the JSC report, the packed House gave him a roar of approval. The Prime Minister in his reply said “I recognise all the emotional and practical difficulties faced by those whose loved ones are missing”. The weekend of 18 March was the Miles for Missing People race and the third Anniversary of my daughter Claudia going missing. There was lots of media coverage both on TV and radio. The momentum is there. Please ask your MP to help keep up the pressure. Everything is there for Government: a draft bill on both issues, a Consultation Paper and cross-party support in both Houses, all provided by solicitors acting for Missing People. It is therefore a quick, low-cost measure for the Government, which should take this opportunity to show it cares for its people. Kenneth Clarke and Jonathan Djanogly should see that there is absolutely no valid reason to say no to proposed changes, so I look forward to a positive response. If you would like to help the Missing Rights campaign watch this video, then follow the simple steps to email your MP. A concise read. I will post the link shown at the bottom of the page wherever I can. Thanks you Peter.